Hey! It's been a while. Last week we had a mission wide P-day for all the teams in the city areas and we got to go to a Twins baseball game. It was epic! Twins vs. Astros, with a last inning, 2 outs, full count home run for a crazy Twins victory! It was super fun to watch and be with some past companions. The bummer was it also took up all of our P-day. So lucky for you, this week is gonna be packed with two weeks’ worth of goodness! Man, I'm loving my new area so far. It feels so good to be in full Spanish work for the first time since my first area of the mission. I still have a lot of catching up to do on my Spanish, but my companion also served in full English for quite a while. So, we are both studying like animals. The new zone is super cool. We call it the "international zone." We have one full Spanish district, the Hmong district, and the Karen district (Both crazy Asian languages spoken by a ton of immigrants here in St Paul). 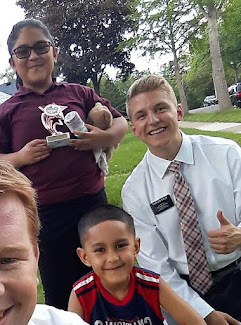 my new compañero, Elder Calderwood, is chevere too. Another one from Utah! Lol. He's a strong missionary with an even stronger testimony of Christ. The ward is great! About 70 or so active members. Lots of solid families. One thing that made me laugh when I first got here is there are like 6-7 families with the last name Rodriguez. So, when I met one of the Hermana Rodriguez’s she told me, "bienvenidos al barrio de Rodriguez" - welcome to the Rodriguez ward! 😂 We had a wonderful fast and testimony meeting. The cool part about the ward is that almost everyone is a convert to the church, and there are so many powerful testimonies of Christ! I've been amazed by their faith, they know that the priesthood power is real, and we have given a ton of priesthood blessings this past week! We've also been doing some noches de Hogar (Family Home Evenings) with some less active families to try to strengthen them. Another funny thing from Sunday is our Sunday-school teacher is from Brazil, and so she speaks Spanish with a thick Portuguese accent and I felt like I was back in MTC in Mexico because I could barely understand her😂. In our ward, we just got a new set of hermanas so now it is us elders, and two sets of sisters. As a result of that, our area basically got split in half and we passed off a lot of investigators to them. We've been in grind mode trying to find more people to teach. We've had a few really powerful first lessons with people, and also found a part-member family that wasn't in our records who we are going to start teaching! We've had a pretty good start to the transfer. "Nothing opens the heavens quite like the combination of increased purity, exact obedience, earnest seeking, daily feasting on the words of Christ in the Book of Mormon, and regular time committed to temple and family history work." His talk was inspired of God! We've been focusing as a zone to increase our ability to receive guidance from the Holy Spirit, and it's made such a huge difference. Ahora. Let me explain the adventure that was this weekend. It was one crazy experiencia. It started out with a breakfast run to IHOP with this super chido member of the ward. When we got there it was snowing!! There was a forecast of 3-9 inches of snow. We didn't think anything of it, because it had already snowed like 6 times in April, and more often than not they predict a lot more than what actually ends up falling. The most memorable event that happened amidst the snow was definitely Beraki's baptism! Later that morning, I got to go back to New Brighton to see him again and see a lot of great members I didn't get to say good-bye to. Before the baptism, Beraki looked at us and smiled and said, "God has blessed me with white snow on the day my sins are washed clean." What an amazing gift from God to bless Beraki with white pure snow on his baptism day -- a perfect symbol of Isaiah 1:18 "though your sins be as scarlet, they shall be as white as snow." He was so excited to make covenants and dedicate the rest of his life to God! My previous companion Elder Strong got to perform the baptismal ordinance and I was also in the water helping him up because he is so frail. I can't tell you enough how special the experience was! Beraki has been close to God all his life, and God has been preparing him all his life for this moment. There was a special spirit there, and it was hard to find a dry face in the room. I think it hit me the most when, after the baptism, Elder Strong and I both went to help him change back into his clothes, and we both were bent over to help put on his socks and shoes. I had a thought pop into my head of the Savior Jesus Christ bent down in front of his apostles, washing their feet. Tears filled my eyes as I realize that both of us were literally serving him as Christ served his disciples. As literal representatives of Christ, we helped Beraki come closer to his Redeemer. And at that moment I had a burning feeling of joy and gratitude in my heart that we were able to find him and be instruments in the Lord’s hands in bringing him into his kingdom here on earth. What an amazing experience!! Following the baptism, we took a gander outside to find the wind blowing snow around like none other. So, we start heading off to try to make it back home before the roads get too bad, and it was just completely white out conditions. We couldn't see 10 feet in front of us or even where the side of the road was, so we decided to wait it out in the church. Well, that decision backfired on us as 2-3 hours later because, although now we could see, our cars were buried in!😬 We had to make it home so we weren't trapped at the chapel with no food haha. So, all four of us elders grabbed the shovels in the church and had to shovel a runway for the car to get to the exit of the parking lot! Long story short, we eventually made it to the new Brighton apartment and took shelter there. We helped push some people out of the snow, and got stuck multiple times ourselves. Good times! We made it home the next morning after the plows made their way through, but then it kept snowing hard and they cancelled church.. in April! Que the heck!? The day ended on a high-note, after setting up lots of appointments for the week and venturing out in the snow doing service, Elder Calderwood and I did two baptismal interviews for these two really powerful Karen kids. The Karen elders translated, and it was a whole different world inside their house. Definitely a super sweet culture! The Spirit was so strong there because they had such strong testimonies and it was a really cool experience. Guys, I can't even remember what spring is anymore! Haha! just kidding. Just to put it into perspective, we got 15 inches in the Twin Cities since Friday making it the largest April snowstorm on record, and we've had 25.2 inches total in April, which is the most snow in April, even breaking the old 1983 record. Aaannddd... we are supposed to get 4 more inches on Wednesday!😂 It has been quite the adventure here in Minnesota, but honestly I have grown to love it so much. Every time it snows like this, I feel like we are just so blessed and filled with joy because of all the opportunities we get to help people shovel, get unstuck, and just talk to and love those whose hearts have been softened. I love my mission, and I love my Savior Jesus Christ! I'm grateful for him and his sacrifice, and the fullness of his gospel that we have on the earth today.